Delhi’s garbage conundrum is not new. With garbage hills piling up and a systemic failure in the way the corporations are running, everything has come to a standstill. A bench headed by the National Green Tribunal (NGT) on Tuesday (January 10) issued a notice to the East Delhi Municipal Corporation (EDMC) and Sanitation Workers Union to appear before them on Wednesday (January 11), on the account of the recent strike by the sanitation workers and the menace of waste piling up in the city. It also sent a notice to the Ministry of Urban Development and Housing, Centre and the Aam Aadmi Party (AAP), seeking a response on the matter by January 11. Around 20, 000 civic workers of the EDMC have gone on an indefinite strike for the fifth time since 2015 for non-payment of salaries. The big question is why is this happening every year for municipalities that are the richest in the country? Over 9,500 tonnes per day (TPD) of garbage is generated per day in the city. About 8,000 TPD of waste is collected and transported to three landfill sites at Bhalswa, Okhla and Ghazipur. Actual waste generation in the city could be much higher, as a bulk of the waste is managed by the informal sector. 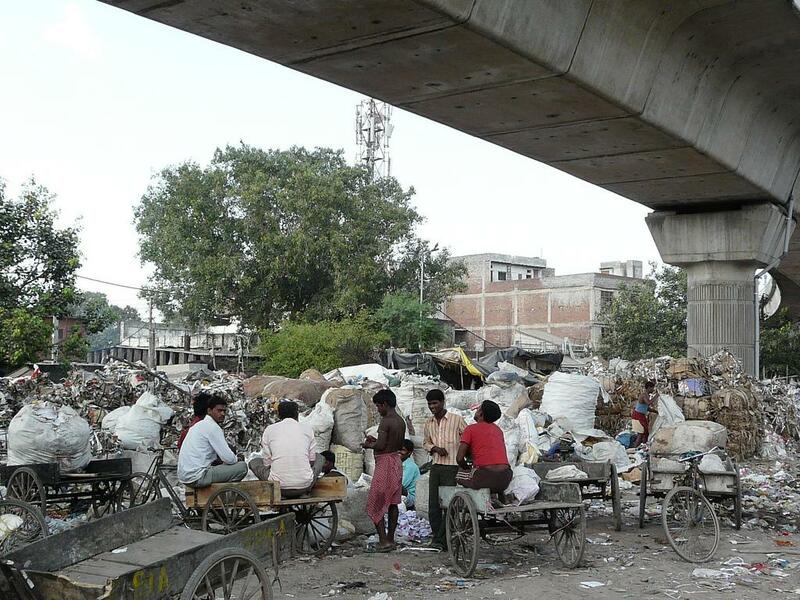 According to an estimate, there are about 150,000 rag pickers in Delhi. Worst, the three landfill sites are not designed as per specifications mentioned in the Solid Waste Management Rules, 2016. According to the Master Plan for Delhi, 2021, these landfill sites had exceeded their capacity way back in 2008. Most of these sites have contaminated the aquifers and groundwater in and around their neighbourhoods. As per the latest draft manual on municipal solid waste management prepared by the Union Ministry of Urban Development, three million tonnes of waste can be accommodated on 40 ha of land (keeping in mind that the life of a landfill is 20 years). Delhi needs 800 ha of land, which would cost Rs 80,000 crore going by the present circle rate! But the city simply does not have the land. In addition, municipalities are required to incur recurrent operating expenses on labour and machinery at the landfill, which comes to about Rs 300 per tonne of waste. Expenditure on transportation is nearly Rs 800 per tonne (according to Tufail Ahmed, who has been managing landfills in Delhi for almost three decades now). According to an assessment by the Centre for Science and Environment (CSE), every tonne of waste disposed of at a landfill would cost the MCD about Rs 14,500—a sum that is highly unsustainable. Landfills are clearly not the answer! Waste-to-energy, as an idea, has been sold to urban local bodies like magic bullet. Burn and forget. But that is not happening. The residents of Sukhdev Vihar know the plight of a WTE plant right next to their houses. They have not opened their windows in years. The Okhla Waste-to-Energy plant is taking up close to 2000 TPD of garbage. Waste for this plant is largely collected from south Delhi: while the South Delhi Municipal Corporation (SDMC) sends in 1,800 metric tonnes per day (MTD), about 200 MTD is fed by the New Delhi Municipal Corporation (NDMC). Five MW of electricity can be generated by incinerating 450 tonnes of the solid waste in an hour. A total investment of Rs 250 crore has been made in the plant on a land of 5.6 hectares. The tribunal has been hearing a petition filed by the Sukhdev Vihar Residents Welfare Association, demanding the closure of a waste-to-energy plant, alleging that it uses illegal mass-burning technology that causes air pollution. However, the plant is still running and even the green court has not asked for any action. As per the NGT order in 2015, states were directed to adopt a cluster approach for waste management. As more waste gets generated, more land will be required in this scheme of things. Many clusters will be required. It is evident that the cost of transport is a key component of waste management and farther the site, the higher will be the transportation cost. It is also clear that decentralised solutions will cut costs of transport and make households and institutions part of the solution. But why aren’t we keen to adopt them? A look into the detailed project reports (DPRs) and contract agreements signed by the concessionaire (private party) and the municipality exposes the fact that segregation of waste is limited to documents only. The concessionaire is responsible for door-to-door collection, but takes mixed waste from houses as it increases the tipping fee/tonne of waste. As per an official of the NDMC, segregation of waste reduces the tipping fee given by the municipality to the concessionaire. The amount of the fee also varies widely from municipality to municipality. On December 22, 2016, a judgement by the NGT directed all states and Union Territories to submit their action plan in terms of the Rules of 2016 by January 20, 2017. The action plan would relate to the management and disposal of waste in the entire state. The steps are required to be taken in a time-bound manner. As per the judgement, the plan should be in accordance to the principles of circular economy. What’s obvious from the recent judgement is that hybrid plans are needed to save the cities from drowning in their garbage. A mix of technologies such as biomethanation, composting, conversion to refuse-derived fuel (RDF) and converting waste to power generation is the only solution. Every state and UT has been asked to implement the SWM Rules, 2016 in all respects. The Environment Ministry in April 2016 had revised the 16-year-old rules for solid waste management with an aim to start more solid waste treatment plants across the country and set agendas for central ministries, state governments and local bodies. Also, in accordance to the rules, the states and UTs were given one year for ensuring compliance of the prepared action plans. The NGT judgement has extended this time frame to July 1, 2017. Any State or UT, which fails to comply with the statutory obligations, shall be liable to be proceeded against in accordance with Section 15 of the Environment (Protection) Act, 1986. Besides that, it would also be liable to pay environmental compensation, as may be imposed by this tribunal. The NGT has also directed the imposition of an environmental compensation for open burning of wastes. For each default, the violators shall be liable to pay environmental compensation of Rs 5,000 in case of simple, and Rs 25,000 in case of bulk waste burning. The environmental compensation shall be recovered as arrears of land revenue by the competent authority as per the law. The WTE plants across the country were also directed to run on segregated waste only. We need hybrid solutions. We need a landfill, but only for rejects and inerts. We need waste to energy, but then such plants should ensure that they run on segregated waste only. With over 50 per cent biodegradable waste, there is high potential to compost or generate biogas out of the segregated wet waste. And all this cannot work, unless we segregate at source. With over thousands of crores being spent on collection and transportation, time has come to think out of the box. We can learn from our neighbours and cities across India that are doing commendable work on waste management. Look at the Alleypey model, where residents have taken it upon themselves to segregate and treat waste at source. It is the best model in the country on decentralised waste management. We can even look at Panjim; the municipal corporation not only ensures segregation at source, but also segregates dry waste into 30 different categories. And then there is Mysuru, Suryapet, Bobbili and a lot of other cities that are doing commendable work. They have adopted local solutions, not global to become zero-waste cities. The CSE has documented cities that are doing commendable work on waste management. We need to take waste management in our hands. Time has come to make it a habit. Just like brushing our teeth. Every day! Good article. Why can't we have separate contractors / entrepreneurs for biodegradable waste collection and allow local level compost making? It could be a good start-up. If INDIAN GOVERNMENT READY FOR PROCSSING MSW GARBAGE PROCSSING PLANT WITH ZERO LANDFILL AND ZERO POLLUTION GARBAGE TO ENERGY PELLETS .